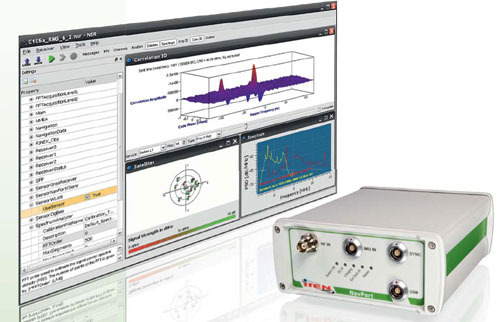 IFEN GmbH has begun shipping the first units of its new second-generation, multi-frequency and multi-GNSS software receiver — the SX-NSR. The Poing, Germany–based company has also announced that the Galileo Test and Development Environment (GATE) facility that it instrumented and operates near Berchtesgaden for the German Space Agency (DLR) has been certified as a Galileo open-air test laboratory conforming to ISO 17025. Designed for scientific applications and advanced GNSS research and development, the SX-NSR supporting GPS, GLONASS, Galileo, the Quasi-Zenith Satellite System (QZSS) and space-based augmentation systems. The receiver’s NavPort RF front-end supports up to four L-band frequency chains in real-time. A second NavPort can be synchronized with the unit to provide heading, dual-tracking, or eight RF chains. The SX-NSR contains an integrated barometer sensor, has the capability to synchronize external inertial measurement unit (IMU) and magnetic sensor data, and also supports advanced sensor fusion applications. Users can customize the SX-NSR with processing through their own application programming interfaces (APIs). IFEN offers a software-licensing scheme with the receiver that enables users to “unlock” GNSS signal capabilities as they need them. As for the GATE certification completed in April by independent third-part certifier TÜV SÜD and validated by GATE consortium partner NavCert GmbH, the new status enables GATE customers to test receivers operating in receiver autonomous integrity monitoring (RAIM) mode for safety-of-life applications. Gate has now finalized its signal upgrade and certification phase. The new certification joins previous approvals for GATE transmissions of Galileo Open Service, Commercial Service, and a ”dummy” Public Regulated Service (PRS) signal. “We are delighted to receive this certification,” said Günter Heinrichs, IFEN’s head of customer applications and GATE project manager, “which shows again the important of GATE for the development and testing of Galileo equipment and applications, especially in the light of the upcoming launch of the first two Galileo ION [in-orbit validation] satellites.